Wouldn't it be great if you could take the parts of styles you like and combine them into one style you really, really like? Well, you can do just that. In this lesson, I'll explain how. I assume, by the way, that you have already read, and tried, the previous lesson on converting a two-variation style to a four-variation style. Because, if you have, adding the next step, which is basically copying a style part from some other style, is pretty simple. There is no substitution for experience. So, in this lesson, you are going to get some experience creating your own style. I'll make the whole lesson an exercise that you can follow along with. Once you see how it is done, you can fly forth and be creative! Before we get started, clear out some space in your USER style area. We will want to load a few styles there temporarily as we work on them. Except for the style we are modifying, you don't actually have to do this. But, if you do, it will cut down quite a bit on the number of buttons you have to push in the process, thus making everything a bit easier. If it isn't already loaded, load the Heartbeat style from the POP & ROCK category. If you are reading this lesson, you are not a complete novice, so I won't go over every little detail. You already know how to load & save styles and how to get into the STYLE CREATOR in DIGITAL RECORDING. If you don't, you'd better review some previous lessons. Save the style in the USER area, but give it a different name. Being very creative, I called mine "HeartBeat2". You, of course, can use any name you like. To simplify matters, let's load the other styles we are going to use and save each one of them in the USER area as well. From POP & ROCK, load CountrySwing1 and save it in the USER area. We'll take the rhythm sections from here. Load Country8Beat and save it in the USER area. We will take PHRASE1 from this style. Finally, load BigBandMid2 and save that in the USER area. If you are pressed for room, as I said earlier, you don't have to move these to the USER area; you can copy the tracks from these styles in the PRESET area. OK, let's start. Load your newly renamed style from the USER area. We can go right into the STYLE CREATOR. Press DIGITAL RECORDING and then select STYLE CREATOR. This brings up the BASIC tab. Press the [NEXT] button and you will be at the ASSEMBLY tab. This is where all the work is done. You will be familiar with this page from the previous lesson. We will go through each section (MAIN A to B to C to D) and replace the RHYTHM1 and RHYTHM2 tracks with the corresponding tracks from CountrySwing1. In the STYLE CONTROL section of the keyboard, press the MAIN A button to select the first style section, the A section (be sure to confirm your selection in the pop-up window that you see on the STYLE CREATOR screen.). Now press [A] to select the RHYTHM1 track. Press [A] once more and you will see the STYLE file screen. It should be pointing to the USER area. Double-click on the CountrySwing1 style that you have stored there. Double-clicking will select that style and immediately take you back to the ASSEMBLY page. The style name under RHYTHM1 will now be changed to CountrySwing1. On the bottom of the page, MAIN A will be highlighted under SECTION and RHYTHM1 will be highlighted under CHANNEL. What this all means is that you will be copying the RHYTHM1 track in SECTION A from CountrySwing1 and saving it in the style you are now working on. Repeat steps 1-4 for RHYTHM2: Press [B] twice. Double-click on CountrySwing1 style. If you had not moved the CountrySwing1 style to USER area, you would have to press [BACK] to go to the PRESET tab, then select the POP & ROCK folder, then select P4 to go page 4 and, finally, select CountrySwing1 style. If you are copying a lot of tracks, this can get tedious very quickly. You need to repeat this process for the other three sections. Press MAIN B to move to the B section and replace the two rhythm tracks there with the ones in CountrySwing1. Move to MAIN C and then to MAIN D to replace those tracks. At this point, you might save your new style and try it out. Select the SAVE option by pressing button [J] on the right-hand side of the screen. Then select SAVE again ([6-B] button) to save your file in the USER area. Press [EXIT] enough times to get back to the MAIN screen and try out your style. If you examine the tracks in this new style, you will notice that none of the variations include a PHRASE1 or PHRASE2 track. Let's expand the style by adding a new track. The Country8Beat style has a guitar playing in PHRASE1 for the MAIN C and MAIN D variations. 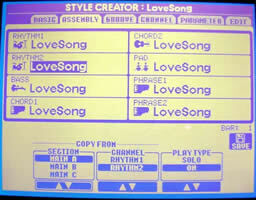 We will copy that track to our new HeartBeat2 style. Since we are only copying one track in two sections, this will go a bit quicker. Get into the STYLE CREATOR and go to the ASSEMBLY page. Select MAIN C to edit the C tracks. Press [H] again to go to the style file page and, from here, select Country8Beat. Move to the MAIN D section and replace the PHRASE1 there with the corresponding track from Country8Beat. Save your changes and test out the style. The CountrySwing rhythm is not radically different than the original Heartbeat and adding the Country8Beat PHRASE1, again, only makes a minor adjustment. Let's be more daring. If you listen to BigBandMid2, you will notice a nice walking bass line in that style. Let's replace the bass line in each variation with the bass from BigBandMid2. By now, you should be pretty familiar with how to do this. Go back into STYLE CREATOR. Go to ASSEMBLY. Select MAIN A, then select the BASS track -- double-click on it to select it and immediately go to the file page. Select BigBandMid2 as the replacement source. Do this for all four sections. Save your style. Now that you've changed parts of that style, the previous one-touch settings may not be as appropriate as you would like. Go ahead and modify them. Review our lesson on modifying one-touch settings if you need help. Be sure to SAVE the style again when you have made your OTS modifications. You don't have to go back into DIGITAL RECORDING. Just SAVE the style and your new OTS will be saved with the new style. To hear what my final adjustment sounds like, download HeartBeat2 and try it out. You can still recognize some of that original Heartbeat, but it is an entirely new style. And now that you know how to mix and match, you can create as many new styles as you want.